Ca' Formosa Guest House Venice > Rooms > great value for money rooms in this 3 star budget guest house in Venice. Our rooms at the Ca' Formosa Guest House in beautiful Venice are stylishly decorated and complete with all modern amenities. With just eleven rooms, guests are guaranteed friendly and personal hospitality. View some pictures of the rooms, or take our virtual tour of the grand interior of this fifteenth century town house. Named after important Doges of the ‘City of Light’, the high-ceilinged rooms appear very spacious and are furnished with traditional Venetian flair, spotlessly clean and comfortably air-conditioned. The upper floor Casanova and Tiepolo roof suites are particularly special rooms, offering wonderful balcony views across the Venice skyline. What could be more romantic? The Dandolo, Orseolo and Bembo rooms boast views of one of the many canals that are the aquatic arteries that give life to this unique city. All rooms are equipped with air-conditioning and include en suite bathroom facilities, including bidet, hairdryer and shower. 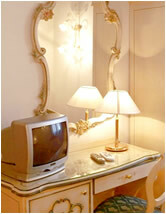 Each room has a direct dial telephone and internet access, satellite television, minibar and safe. Our front desk is open 24 hours, so staff will be on hand to assist you in any way necessary. There is an iron and ironing board, kettle and also a desk for the convenience of the business traveller. Laundry facilities and room service are also available. Also available is the Apartment Formosa, a self contained flat with two double bedrooms, two bathrooms and large dining area and is available for 2-4 persons. Alternatively, similarly excellent but also cheap 3 star accommodation is also available in Venice in rooms at the nearby Malipiero suite.